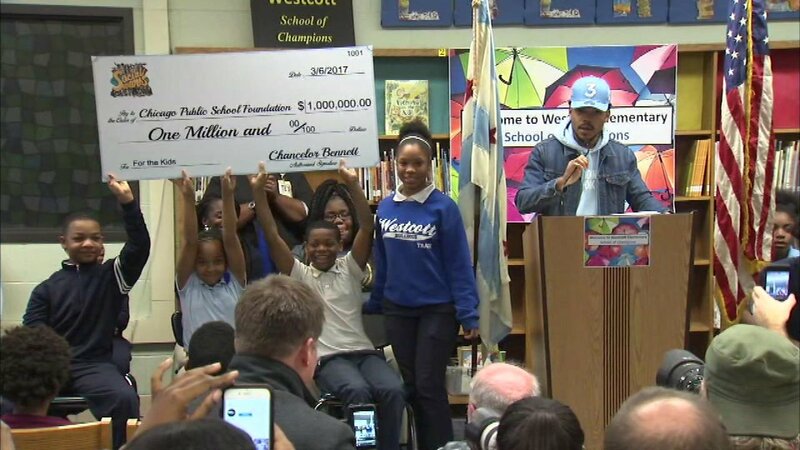 CHICAGO (WLS) -- Chance the Rapper announced Thursday which nine Chicago Public Schools will be receiving $10,000 checks. The 23-year-old rapper, whose real name is Chancellor Bennett, announced he is donating $1 million of his personal money to CPS earlier this week. Chance also called upon private businesses and corporations to donate money to the school system. For every $100,000 in donations, Chance said his organization Social Works Chicago will donate an additional $10,000 to individual schools to further support arts education. Chance the Rapper announced Monday he is donating $1 million to the Chicago Public School Foundation after meeting with Gov. Bruce Rauner last week to discuss funding options. "The check that I donated is a call to action. I'm challenging major companies and corporations in Chicago and across the U.S. to donate and take action," he said. A product of Chicago Public Schools himself, Chance returned to his hometown following his three-Grammy win to try to use the weight of his fame, as well as the funding from it, to help the cash-strapped public school system.